The Overland Wellness team is excited to invite you to our open house. This is an exciting opportunity for us to unveil our newly remodeled offices in the Paulsen Center. This will be an opportunity to get to know Spokane’s Naturopathic Physician and Licensed Acupuncturist, Dr. Heather Overland. You will have the opportunity to ask questions about acupuncture, natural medicine, holistic concierge care, and any of the other wellness topics you’ve been curious about. This will be a relaxing and casual event to socialize with Central Business District colleagues, enjoy our wellness space and talk to the Doctor. Refreshments will be provided. Stop by after work, stay for a bit, and enjoy! 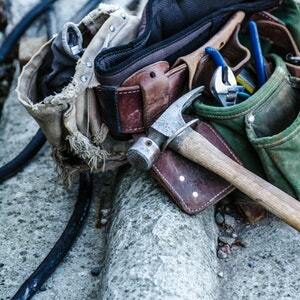 After years (decades) of schooling, the last thing many of us want is to go back to school. However, continuing education is both a requirement to maintain an active license as a doctor, and part of how to stay current in the continuously developing world of medicine. While my practice is rooted in traditional medicine and includes techniques such as acupuncture that have been used in some form for thousands of years, I feel that the practice of holistic modern medicine is rapidly changing and improving. I am quite happy for the opportunity to use the best new laboratory studies, sterile single-use supplies and diagnostic equipment that is leaps and bounds above what it was ten years ago (let alone 1,000 years ago). One of the pleasant changes I’ve noted recently is the collaborative and truly integrative nature of many of the continuing education courses. Nowadays, many doctors and allied health professionals from differing backgrounds and seemingly different schools of thought are getting together to learn strategies and clinical updates to best help their patients. Our shared desire to provide optimal care for our patients has led DOs (Doctors of Osteopathic Medicine), MDs (Medical Doctors), and NDs (Naturopathic Doctors) like myself to get together, share our clinical experiences, and pursue continuing education focused on holistic and integrative therapeutic techniques. I’ve focused on topics that I personally find interesting and feel are highly pertinent to the active patients I see every day. Topics have include TBI (traumatic brain injury), integrative pain management, injury recovery, and IV therapy. One amazing thing about conferences is that I can not only refine my current practice, but I also gain the opportunity to learn about topics I may not see daily, such as SIBO (small intestine bacterial overgrowth) and clinical applications for LDN (low-dose naltrexone) therapy. The opportunity to take disparate clinical focuses, such as gastroenterology or pharmacology, and incorporate their nuanced understanding about specific systems into a larger understanding of how an imbalance can contribute to the progression of commonly seen symptoms and diseases is one of the awesome things about holistic medicine. We get to treat the patient as an entire person, not just component parts or systems, and we also get to learn from the expertise and in-depth understanding of specific systems to best address the whole. Thank you to everyone who participated in the fall Gallatin County Health Fair! I was given the honor of being asked to host a booth at the county health fair, and had the privilege to promote wellness while coordinating with other local health and wellness providers. I also had the enriching experience of pursuing continuing education and connecting with my colleagues at the Montana Association of Naturopathic Physicians fall meeting. 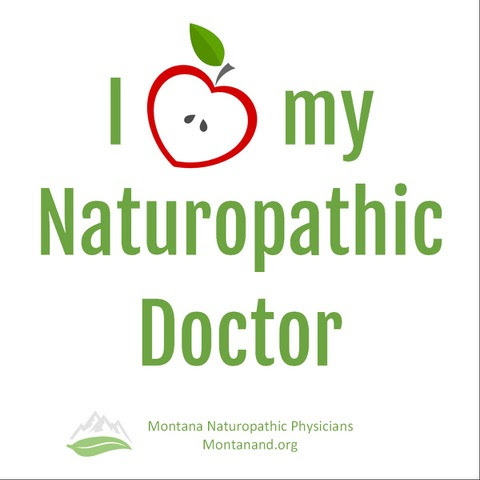 While they may not have the high numbers of Naturopathic Physicians that Washington has, Montana and Washington both have very high quality practitioners who are dedicated to providing excellent healthcare and improving the wellness of our local communities. I’ve been dreading the hazards of summer. The lingering snowfalls of winter turned into a blustering, stormy spring that provided green landscapes through July. This verdant beauty allowed me to maintain a naive sense of optimism regarding what summer would hold. I held out hope that the heat and smoke of last summer was a rare occurrence, wishing that clear skies, warm temperatures and living greenery could persist until we reach the cooling and drying effects of fall. Most of all, I dreamed of never seeing the hazy discoloration of smoke obscure our perfect mountainous horizon. My idyllic summer fantasy wilted a bit after waking up coughing in the dark this month. Unfortunately, both the sun and my lungs had to fight through a blanket of smoke to start the morning. The smoky haze in the air appeared as if it came from a gritty post-apocalyptic movie. While no futuristic vehicles and villains have accompanied this change to our landscape, it is not without its own dangers. Wildfires, grass and debris burning can cause a significant impact on our air quality. While fire is a valuable part of the life cycle of certain plants, some habitats may not be as able to cope with fire. The effect of fire can also be very widespread. 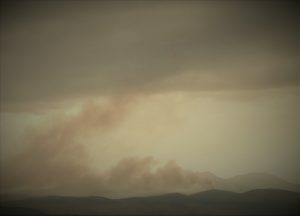 While some of the smoke has come from nearby fires, some of the diminished air quality and visible smoke is attributable to fires raging in other regions. The sometimes heated topics of water allocation, forestry management and land use regulation are outside of my area of expertise. However, I am highly familiar with the health consequences of fire season. Some studies have confirmed the obvious, that wildfire smoke exposure increases respiratory illness and severity of respiratory symptoms. Others have even noted an association between smoke exposure and worsening mood. Some have made the startling observation that when it is smoky out, people may be more likely to die in general, not just from respiratory complaints. Further research is needed to determine who is particularly susceptible, what toxins or particulates are culpable for the worst consequences, and to determine what methods are the most effective at preventing and reversing the health hazards associated with smoke exposure. If such smoke exposure continues to become a regular part of our seasonal summer experience, both research and a practical plan to cope with such seasonal exposure is necessary. For people with respiratory illnesses and sensitivities, a specific action plan tailored to their illness and treatment options should be developed with a physician. This is a time where having up to date prescriptions and appropriate dosing strategies for both daily and emergency medications could be life saving. Other parts of the plan can include reducing other exposures and evaluating what lifestyle and household modifications are necessary. Complementary strategies can include therapeutic nutrients, herbal medicines, acupuncture, and even dietary changes to better cope with the added strain of smoke exposure. There are pharmaceutical as well as complementary strategies to manage respiratory illnesses and stay healthy during fire season. Now is a great time to schedule a check-up with your physician and to develop a comprehensive and holistic wellness plan with Dr. Overland.